View a list of all songs. Navigate to the menu screen. Press to skip to the desired location. Press the [MEDIA] button, and select [My Music]. My Music cannot be selected if it does not contain music. Check the content of your USB drive before saving music to My Music. 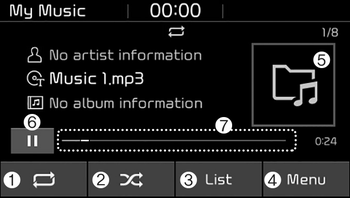 Press the [SEEK/TRACK] button to play the previous or next song. Press and hold the [SEEK/ TRACK] button to rewind or fast forward the currently playing song. Search songs by turning the TUNE knob and press the knob to play. Press the [List] to see a list of songs available for play. Select and play the desired song. Press the [Repeat] to enable or disable ‘Repeat all’ or ‘Repeat current song’. Repeat all: All songs in the playlist are repeated. Repeat current song: The currently playing song is repeated. Press the [Shuffle] to enable/disable ‘Shuffle’ play. Shuffle: Songs are played in random order. Press the [Menu], and select the desired function. 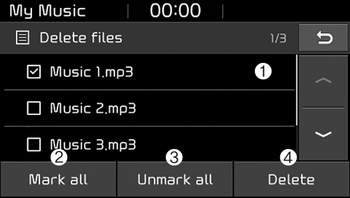 Delete files: You can delete files from My Music. (1) File: Select saved file. (2) Mark all(Mark All): Select all files. (3) Unmark all(Unmark All): Deselect all files. (4) Delete: Delete the selected file(s). - Select the file to delete, then press the [Delete] to delete it. - Delete is canceled if voice recognition is activated or phone calls are received or made during delete. Add to playlist(Add to Playlist): Frequently played songs can be paired in a [Playlist]. - Songs can be played from the [Playlist]. Information: Detailed info on the currently playing song is displayed. Sound Settings: Audio sound settings can be changed. Scan: All songs are played for 10 seconds each. 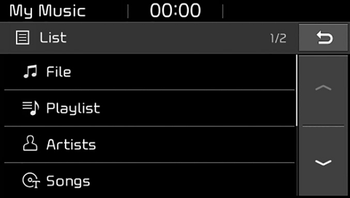 When a song in the playlist is playing, press the [Menu] and select [Delete from playlist(Delete from Playlist)]. Select the song to delete, then press [Delete].